Outstanding Biedermeier cut-glass beaker with painted view of Cathedral Saint Stephen in Vienna: Picture created by famous glass painter Anton Kothgasser (1769-1851). The beaker's front side shows the gothic cathedral with late Romanesque main entrance so-called 'Riesentor' in German as well as the southern tower with height of 136,7 metres - this one being Vienna's cultural landmark. - The painted picture is edged by golden border with flower's blossoms and leaves / additionally, an inscription with golden painted letters is existing: 'La cathédrale de St. Etienne à Vienne'. - The beaker is of tapering type / its inner wall as well as backside of outer wall are golden painted. The edge of beaker's foot is decorated with cutting of score-type. Paul von Lichtenberg, Mohn & Kothgasser (Transparent-Enamelled Biedermeier Glass), published by Hirmer (Munich), 2009, pages 286 - 289 (chapter 'Ranftbecher mit dem Wiener Stephansdom'). Opaline pastel green box with hinged lid having gilt bronze mountings / the lid closes properly. The casket's surface with splayed edges has an overall crosshatched cut pattern with small flower's blossoms surrounded by golden leaves (these are enamel paintings). Stunningly manufactured cameo (casing) glass: Colorless frosted glass of multi-layered type, further powder meltings existing (orange red and brownish as well as yellow shaded). The vase's outer wall is decorated with stunningly cut floral ornaments covering large parts of vase's surface: These consist of orange-red flowers depicting bleeding-hearts attached to thin stems, with wispy leaves growing out of them. Stunningly manufactured cameo (casing) glass: Colorless glass of multi-layered type, further powder meltings existing (= bright rose red as well as orange shaded). The vase's four-sided surface having some artistical dents is made in shagged technique / additionally, it is decorated with stunningly cut floral ornaments covering large parts of vase's surface: These consist of bright rose-red flowers depicting vetches attached to thin stems, with large leaves growing out of them. Finally, the vase of bellied and tapering form type has round foot at area below as well as edged round mouth. FINEST PÂTE DE VERRE VASE OF EXTREME RARENESS (= ALMOST UNIQUE !) 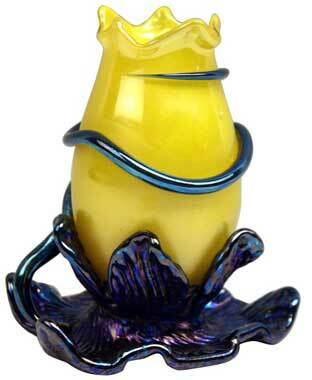 - Stunningly manufactured casting glass: Bright material, inclusions existing - these are ocher yellow and green. The vase's form type is similar to a beaker, on round foot as well as tapering, with wide round mouth. Its surface is excellently decorated with blossoms of Marigold Flowers scattered around / they are shaded in following colors: red of raspberry as well as violet. GABRIEL ARGY-ROUSSEAU (1885 - 1953 Paris) was a sculptor, ceramics artist as well as glass specialist who entered into the equation when the so-said pâte de verre technique had been rediscovered as an important branch of Glass Art around Turn of Century. Huge vase, stunningly decorated glass of superb quality / excellent cutting technique. Colorless glass / casing glass (violet color), at inner side partial opalescent (yellow-orange and cream-like shade). There are numerous blossoms of wysteria with leaves on the surface existing (etched and cut ornaments): These floral decorations are of stunning beauty ! The stalky vase with narrow round mouth stands on massive round foot. - Gallé Mark (Cameo with Star) of Gallé Manufactory of period 1904-06 existing. 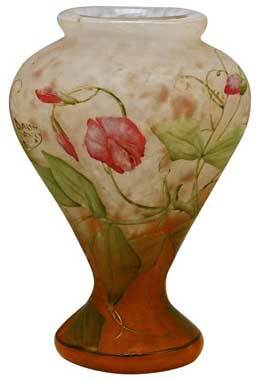 A WILD-ROSE MOLD-BLOWN, OVERLAID AND ETCHED GALLÉ GLASS VASE. - The frosted yellow-cream shading to periwinkle ground, overlaid in blue and deep chestnut, mold-blown and etched with rose hips on leafing branches. Stunningly manufactured casing glass (yellowish-opalescent underneath / bright blue & dark violet shaded at outer wall). - It is a bellied vase of oblong form type, based on footring. The vase's round mouth is framed/bordered. Gorgeous ornaments (having been abundantly applied to surface) decorate vase's wall: These are large blossoms of Clematis Flowers attached to leafy stems covering surface (= gorgeous pattern!). Excellently manufactured casing glass (colorless glass with various layers: milky white and reddish underneath). 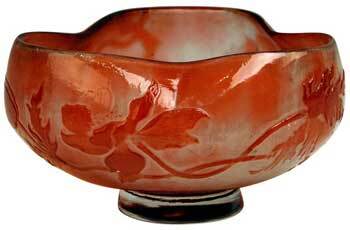 It is a threepart bowl with scalloped upper edge which is drawn-in at three sides. Additionally, there is reddish overlay and etching existing, covering bowl's surface in very decorative manner: These are floral ornaments - depicting Iris decoration with stems, blossoms and leaves - running around bowl's surface in vertical direction. 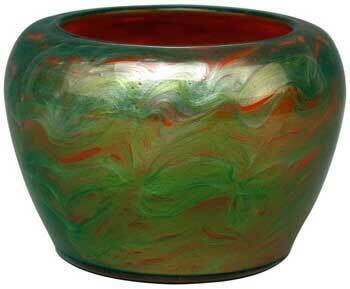 The bowl stands on round foot made of colorless glass. The manufactory Schneider was founded in 1913 by the brothers Ernest and Charles Schneider. The Schneider brothers had studied glass making at Daum Nancy manufactory before they started their own manufactory. The climax of Schneider production were the twenties: They specialized on finest Art Deco glass items. Tall bellied vase of tapering form type, having round mouth, based on round foot. Colorless casing glass with orange-yellow powder meltings, the surface is stunningly decorated with floral decorations (etched technique). As mentioned above, the vase's surface is abundantly decorated, these are stylized flower decorations which are bellflowers with leaves ('campanules' in French): The leaves are covering vase's area below whereas the bellflowers attached to stems grow out from them. Table Lamp with Millefiori Pattern (Murrine). There are various flowers of multicoloured type spread on glass surface of which the lampshade as well as the lamp's stalk - based on round broad foot - are made. The multicoloured flowers have the typical famous Millefiori's distortions. The main colours are cream white and purple red, partially decorated with moss-green spots. Please note: The lampshade is of very special form type - it is shaped like a mushroom ! The lamp's electrics / luminaire is working (the lamp and bulb socket / lamp holder are original and complete / made of brass). Cable complete and switch is working. 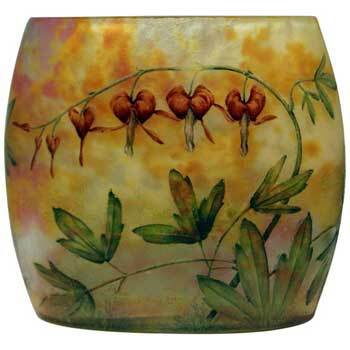 This finest Loetz Art Nouveau Vase is of very special form type: It is shaded as TULIP, being based on round foot from which a stalk is growing out / finally, the bellied part with wide round mouth is attached to top area. The round mouth as well as foot of vase are edged by silver mounting / additionally, parts of vase's surface are decorated with gorgeous silver overlays of floral type - these are decorative flower's blossoms attached to stems artistically made in finest Art Nouveau manner. - The vase (casing glass / colourless glass with yellow underlay) is decorated with silver-yellow & iridescent patterns of wavy form type spun around. 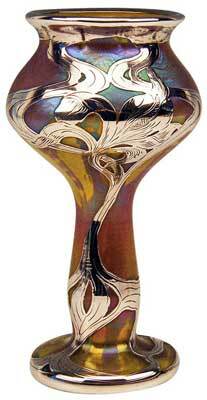 This gorgeous Loetz Art Nouveau Vase is of bellied as well as of oblong form type. The round mouth and foot of vase are edged by silver mounting / additionally, large parts of vase's surface are decorated with stunning silver overlays of floral type - these are decorative leaves attached to stems artistically bent in finest Art Nouveau manner. 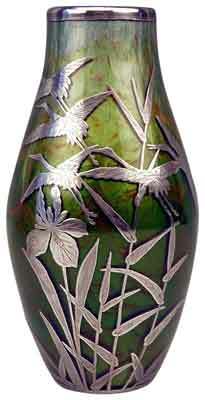 - The vase (casing glass) is shaded in brownish and orange / green-blue iridescent oblong patterns of wavy form type are laid on surface. 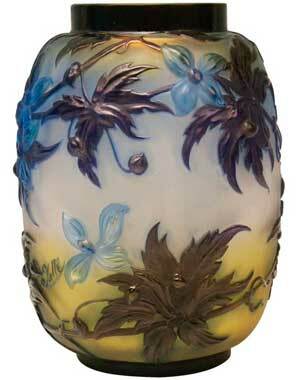 This gorgeous Loetz Art Nouveau Vase is of bellied as well as of oblong & tapering form type. The round mouth and foot of vase are edged by silver mounting / additionally, front side of vase's surface is decorated with RAREST SILVER OVERLAYS of figured form type: Reeds and a flag (= iris flower) are growing out from bottom / additionally, a troop of flying herons - five birds are visible - is attached to vase's front side, too. The vase (casing glass) is shaded in moss green & pastel green and orange / slightly iridescent patterns of wavy form type are laid on surface. The vase's surface is excellently manufactured, having iridescent bright-green wavy lines spun around, covering orange-shaded glass layer underneath: This pattern causes a very interesting effect - the opaque orange colour is contrasting the green wavy lines in stunning manner especially when the vase is illuminated. - The bellied vase stands on round foot (slightly hollow) / it is of tapering form type, having round wide mouth on top. Decoration: So-said STREIFEN UND FLECKEN (= SPOTS AND STRIPES) laid on moss-green glass: This is a pattern of vertical stripes and circular/ovoid spots in a contrasting color. It is a quite early Loetz Decor also used by Koloman Moser and his followers. 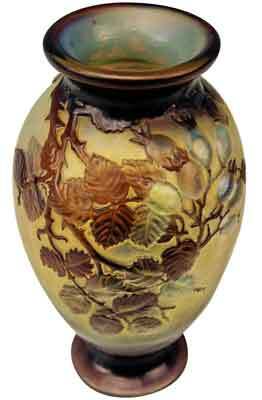 This nicest Loetz Art Nouveau Vase is of interesting appearance: The vase stands on round foot / it has cubical design (= four-sided form type), but it is of tapering form, too, having round overhanging wide mouth on top. Outstanding Loetz vase of quite large size: Oblong and bellied tapering form type; based on round foot which is slightly hollow. Excellently manufactured glass (brownish-golden opalescent glass with slight rose red gleam), abundantly decorated with iridescent bluish spots (= the so-said 'Silberkroeselzungen') which grow from vase's area below to its square area at top side: The radius edges of vase's mouth alternate with the scalloped edged areas there. 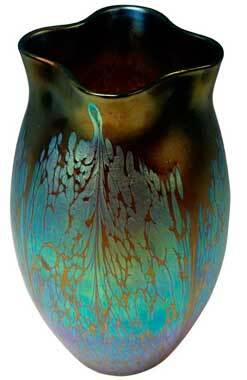 This gorgeous Loetz Art Nouveau Vase is of stalky as well as of bellied form type. 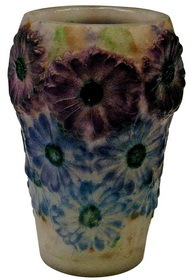 The vase (casing glass) is shaded in orange and blue with slightly iridescent glaze / additionally, orange-blue and green-blue iridescent spots are laid on surface. It is a most remarkable Loetz Vase of bellied and tapering type. Additionally, the vase has overhanging as well as scalloped wide mouth / beyond that, there are three artistically made dents at vase's area below visible. Please note that there are threads existing - drawn into a wave pattern in a mold giving this pattern its distinct ribbed appearance. Additionally, the vase's surface is excellently shining in finest iridescent manner (green-yellow-blue-silver): It is very light 'Silberiris' finish, too. 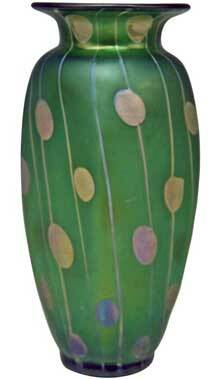 The vase stands on round foot / its reverse side is slightly bulged in (having a slight hollow). Fire polished rim with a ground and polished pontil. This Loetz vase has production number 597 and is a manufactory's variant of the vase with decor of striped pattern once created by Michael Powolny (1871 - 1954) in year 1914 on behalf of the so-said 'Werkbund'. 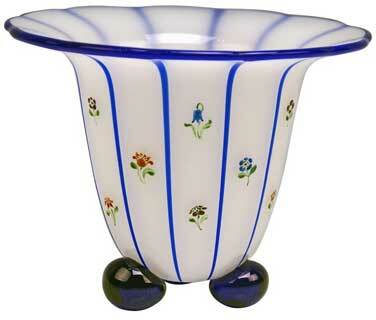 - The vase presented here is a variant of Powolny's design made by Loetz Manufactory a bit later. 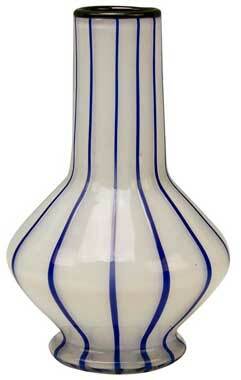 - It is a Loetz Tango opal white glass / Austrian art glass vase with blue vertical threads melted into. Additionally, there are small flowers with leaves (= multicolored enamel paintings) scattered on vase's surface as well as edged by the blue threads mentioned above. Finally, the vase with wide round, slightly scalloped as well as overhanging mouth is based on three dark blue feet shaped as balls / scoops. This Loetz vase has form number 5231 and is a manufactory's variant of the vase with decor of striped pattern once created by Michael Powolny (1871 - 1954) in year 1914 on behalf of the so-said 'Werkbund'. The vase presented here is a variant of Powolny's design made by Loetz Manufactory a bit later. - It is a Loetz Tango vase having long stalk, with elegant white opalescent glass and blue threads melted on surface / the vase's round mouth has edge painted in black color. Top part of this gorgeous as well as rarest Loetz Art Nouveau item is of bellied form type - the vase is shaped like a tulip, having scalloped upper edge: It is shaded in lemon-yellow (lemon-colored) whereas part below is looking like a grommet consisting of sculptured leaves surrounding vase's area below as well as having function of base. Additionally, sculptured threads are spun around the vase. It is important to point to the fact that leafy support and threads are made of fascinating iridescent cobalt blue glass, contrasting the lemon-yellow vase's top part in finest manner.